With no documentation or living family left to question, it seemed a long shot to trace my grandmother’s roots in Newfoundland. My father used to say his mother was from Harbour Grace, that she worked ‘in service’ there. My aunt said no, she was from Salmon Cove or perhaps Trinity. My internet search was proving futile. Without my grandmothers’s birth certificate, birth date, baptism records (which apparently burned in a church fire) or even childhood photos, I didn’t have much to go on. I would have to travel to Newfoundland & Labrador to see what I could dig up, and I would take along my favourite chauffeur, my husband John. My ancestors emigrated to Ontario from Newfoundland about a hundred years ago. My grandparents George Spencer and Elfreda Higden were both Newfoundlanders, as were their parents and grandparents before them. George died at age 50, but Alfreda lived on to age 83, spending her final days living with us in her ‘granny suite’. I decided to focus my genealogical search on her. Here’s what I was told about my grandmother. She was a staunch Methodist, she loved the monarchy, and her deafness was caused by a childhood case of diphtheria. This instilled in her a suspicion and a fear that others were always talking against her, and it gave her a crabby edge. She fought with her husband incessantly. One day, I was deadly embarrassed to catch Elfreda in her raggedy fur coat hitchhiking near our house in the suburbs down to the mall. I ran in to tell my father, but all he said was: “You know she’s from Newfoundland” as if that explained everything. I supposed that Newfoundland was like another country, where they did things differently. Most know of Newfoundland only because the Titanic almost made it there and… well, I guess that was the only time I’d heard of the island before I set off for it, backpack bulging. After hearing it was pretty, I decided I would travel there in an effort to unwind after my harrowing senior year. I wanted to rough it, explore new terrain; I was hopeful for a dose of nature’s rejuvenation after the fluorescent lockdown of high school. My month-long trip started in central Maine. It took 12 hours to drive into Canada, through quaint New Brunswick and rural Nova Scotia, to the furthest tip of Cape Breton Island where “Lick-a-Chick” fried chicken’s neon billboard came out of the misty night as the only sign of life aside from the ferry terminal. 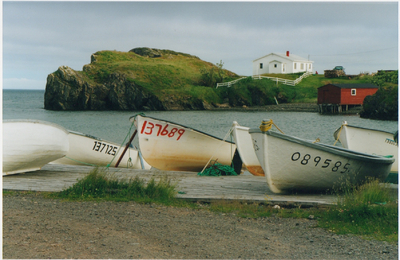 It was a six-hour, overnight ferry ride to Port-aux-Basques, Newfoundland. The early morning fog did nothing to hinder my high spirits and I immediately took off on the scenic, albeit lonely, Trans-Canada Highway. I stopped at every brown and yellow Provincial Park sign, giddy for the start of my venture. J.T. Cheeseman gave me a chuckle with its goofy name, but the chilly tidepools and sweeping dunes were gorgeous. Little did I know the Newfie place names would only get quirkier as the scenery turned more dramatic. I'm a travel writer, which means I'm a hit-and-run artist — New Zealand’s North Island today, the southern Sierra tomorrow. I'm the man who rarely returns. Except to Newfoundland. I've been five times to Canada's easternmost, poorest and most interesting province. That chunk of rock in the North Atlantic, closer to Ireland than to Vancouver, 1,600 miles east of New York, captured my heart an hour into my first visit. On the latest visit, I experienced three lifetime thrills in three consecutive days. Where else on earth can you do that? It began in the tiny town of Springdale, where we hooked up with ace pilot Rick Adams, owner-operator of Springdale Aviation Ltd. I flew over and around massive icebergs making their way south from Greenland. Never before had I seen a berg, and now they were scant yards below the Cessna 185's wing. But if iceberging from a low-flying plane is a thrill, berging from a sea kayak is a life event. Because sea kayaking has a very steep learning curve -- you can be moderately proficient in an hour or so -- and because icebergs have a tendency to get stuck just offshore in the province's protected harbors, the experience is open to the many rather than the fit few. It's a stunning experience. 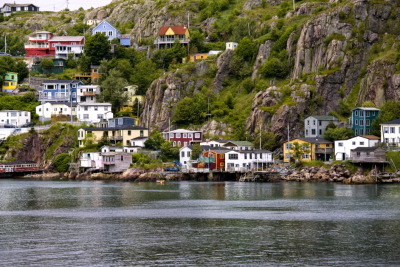 I drove over a hill and down into an outport, Newfoundland for coastal village. My heart thumped a little louder as I spotted the gleaming white of half a dozen icebergs towering above the dark water like dollops of cream on a chocolate cake. I couldn't wait to haul the kayak off the roof of the van.